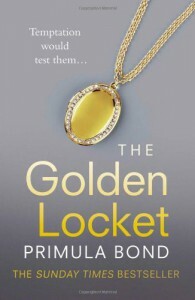 The Golden Locket - "A Single Word ... "
Now if I recall correctly, I didn’t give the first book in the Unbreakable Trilogy a favorable review. Where I said that one was choppy and disjointed, this one had a smoother finish. It didn’t feel rushed and more thought out as we can see more of the relationships growing not only between Selena & Gustav but Gustav & Pierre. Ohhh and don’t let us forgot about Margot and Polly. I can add a few more words to my descriptions this time. Sultry, exotic, scheming, steamy, intriguing, and turmoil would be some that I could use. Although I could say it shows much improvement over Silver Chain, I’m saying I liked but didn’t love it. Last time I had to really stretch to give it 2 stars…this time I can push it to a 3 out of 5 stars. Again please know that I got this free ARC from HarperCollins UK of Mischief Books in exchange that I give my honest opinion in return. Even though I’m not screaming a high review from the roof tops, doesn’t mean that you can’t have another opinion about it. Just know that that these are my words and have no effect on anyone associated with making of the book.